There are several species of Gulf shrimp and we like them all! 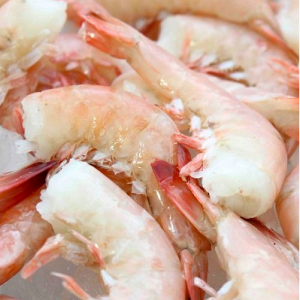 You’ll find our cases full of the Gulf Pink (or Key West Pink) Shrimp and Gulf Brown (or Texas Brown) Shrimp. The Pink Shrimp come in frozen off the shrimp boats on Ft. Myers beach. The shrimp are frozen on the boats while out fishing for two main reasons, cost and quality. Several years ago, during the first major fuel price spikes, the boats could not afford to go out for two days and bring the shrimp in fresh. The solution? Convert most boats into freezer boats and freeze the product the day it is caught. This gives the fishermen the ability to go out for weeks at a time. It also guarantees all shrimp are FRESH frozen. Depending on the time of year, you might also find less common species in our freezers. For example, Rock Shrimp are like a cousin to the pink, brown, and white Gulf Shrimp. They come from deep Gulf waters and they have a hard shell and a sweet flavor, like a mini lobster. 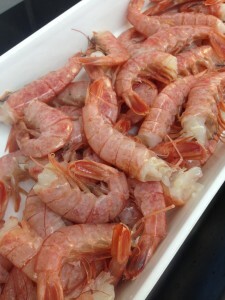 Another rare catch is the deep water Royal Red shrimp. Known for the sweet flavor and bright red coloring. 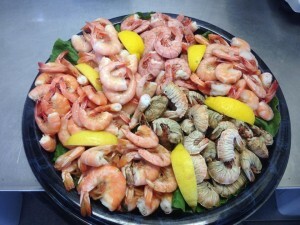 We almost always have the Royal Red Shrimp and are able to get large quantities of shrimp for big parties or seafood boils. Why we don’t eat farm raised shrimp, and why you shouldn’t either..
Our unique location gives us access to several different species of wild-caught Gulf shrimp, and quite frankly, we don’t know why anyone would choose imported over local. Over 94% of the shrimp consumed in the United States is farm raised and imported from a foreign country, but less than 2% of it is inspected by US regulatory agencies. The shrimp caught in the Gulf is all processed by HACCP approved companies. This means that the Department of Agriculture has inspected the facility doing the processing and approved their plan for processing the shrimp. Each plan accounts for every step of processing to assure the shrimp are of the utmost quality and each step is typically documented along with regular temperature checks of the product. (We follow a HACCP plan when processing and storing Stone Crabs and fresh fish because they come directly off the boats at our back dock). So what’s the big deal with farmed shrimp? 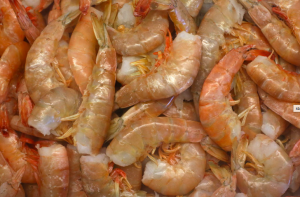 Imported, farmed shrimp, more than any other seafood, has been found to be contaminated with banned chemicals, pesticides, antibiotics and many other unnatural elements. The number one reason for all that: the dirty conditions in which farmed shrimp are raised and processed. These US banned chemicals include antibiotics that are documented as cancer-causing. This is just the beginning of the issues found with farm raised seafood. Depletion of natural mangrove forests and wild fish/shellfish/mollusk populations due to the locations of the pens used to farm has become an environmental concern. The packaging facilities are known for being dirty, they do not monitor temperatures, and often use unsafe water for packing the product. Several articles have been released recently on the dangers of imported seafood and can easily be found online. Moral of the story: don’t buy farm raised shrimp and always ask questions when buying imported products.